In the monologue Peter sagt: (2004), Elfriede Jelinek uses the myth of Prometheus in order to denounce the function of the media during the Second Gulf War. The speaking voice (‘Peter’s’) belongs to a man who is tortured and killed, and whose body (like Prometheus’) is bound to a bridge in Fallujah. The chained body is photographed in that position and so delivered to the unstable eternity of the web. The voice of Peter tells us of the decline of humanity and of the replacement of facts with their images (photographs, video). 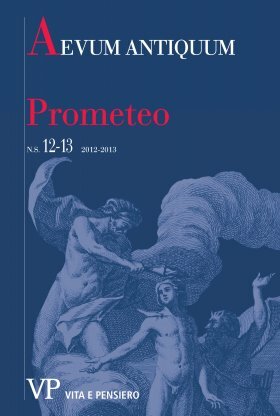 Jelinek’s monologue contrasts, ironically, with Goethe’s hymn to Prometheus (1794), which celebrates the autonomy of man and his emancipation. This article examines Jelinek’s work on the following topics: 1. the Greek myth of Prometheus as an archetypal image of violence; 2. the tragedy ‘Prometheus Bound’ by Aeschylus, 3. the Aristotelian notion of ‘katharsis’ in the age of the media, when the torture at Abu Ghraib has become entertainment.